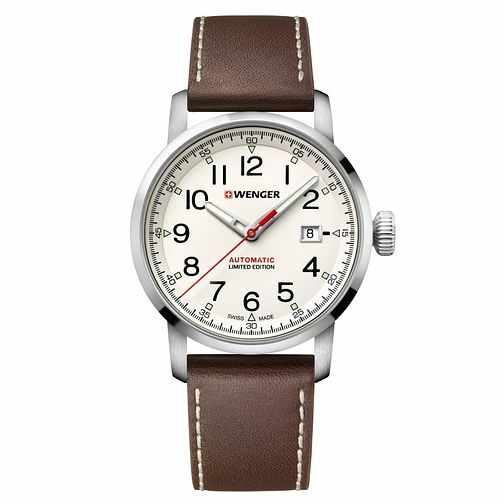 This Swiss Made timepiece by iconic brand Wenger effortlessly combines design with functionality, ideal for the adventurous and sporty man who needs a stylish yet durable wrist companion to keep up with his active lifestyle. The Wenger limited edition watch is perfectly crafted for all your urban escapades, whilst its stylish design means it's fitting for every occasion whether you're on a hike or in a meeting. With it's sophisticated tan genuine leather straps, 43mm dial, stainless steel case, and water resistance up to 100m, the practicality and beauty of this watch cannot be denied.